Instagram has become a popular social media platform, especially for the younger audience. Brands are paying a lot to the influencers, people are making money off Instagram, the attention of the end-user is there, and the opportunities are countless. The only question a lot of people might ask is that how they can grow on Instagram so that they could also enjoy the perks of being on the platform. Well, it’s not easy to get there, but at the same time, it’s not impossible either. You’d have to understand the concept of growing your audience; if you see any Instagram influencer who is getting followers and building a brand on Instagram, you’d notice different things that they do to gain the audience and one of those things is live streaming. Ever since live streaming came along, Instagram has been paying a lot of attention to the Instagram accounts which live stream and interact with their audience through live sessions. What it does is that it brings in attention to the platform and people who are off the platform, hop on to live stream and start using the Instagram. So it’s a win-win situation for the platform, therefore, it’s extremely helpful to use the tool that benefits the platform, which ultimately benefits your profile. It’s quite important to announce live stream at least 10 hours prior to the live stream time. Once you decide and announce the time, don’t change it or delay the live stream. Timing matters a lot because if you start to show up on time, it builds your credibility and people start to understand that you are punctual and it helps you in the future. The more important thing here is that why we should announce our live stream before time. Normally, people don’t always available on social media; they check time to time. If you announce your live stream way before starting it, it will give people a heads-up about the live stream. A lot of people would find out about your live stream and may join it. Another important aspect of the announcement is that you should do on all major social media platforms you use, for example, Twitter, YouTube, Facebook, and LinkedIn. In fact, just before going live, make sure you send out an update on all these platforms that you’re about to go live on Instagram. It does help you in gaining attention from your followers. Do You Want to Learn How You Can Earn Money with Instagram and start your online career? One of the best ways to promote your pre-planned live stream is by talking about it in the Instagram story. Instagram story stays there for 24 hours and your followers could watch it during that time period. It’s a wonderful strategy to keep people up to date and give them a heads-up about the live stream. Many people don’t make Snapchat or Instagram Stories quite often and it’s a mistake if you’re trying to build a social media influence. If you don’t have anything to talk about, just share what you’re up to or answer others’ questions on the topics you are interested in. Moreover, you can share your live stream after ending the live session in the story, and it will be available for 24 hours for your audience to replay it. One of the most important aspects of making an Instagram live stream successful is the topic selection. If you are going live without any topic, it would become difficult to keep the audience engaged. On the other hand, if you have a topic to discuss, and people already know about it, then they could also contribute to the discussion or ask their questions about it. I have seen a lot of Instagrammers and social media experts who do live stream on Instagram and Facebook, and they come live without any topic, and only sit down to read comments and respond to them. There is no harm in responding to the comments and just going through the comments, in fact, it’s important to respond to the comments, but if you don’t have a topic to talk about, then people would start to leave your live stream. The topic of your live stream is something that sticks people to your session because they might be interested in knowing more about it. So if you want to grow on Instagram and using the live stream for that, make sure to always pick up a topic of your live stream. Co-hosting a live stream session means to invite someone in your live stream. 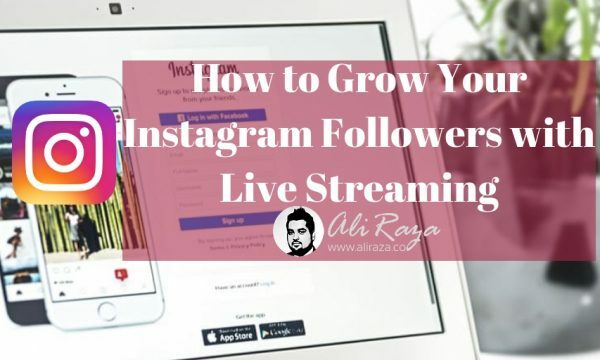 This is a great strategy to grow your Instagram followers because when you invite someone into your live stream, the other person goes live too, and it means the other person’s followers could watch you both as well. Not only does it bring a newness to your live sessions, but it also provides an opportunity for the audience to listen to someone else along with you. Co-hosting a live stream session doesn’t mean you just invite anybody to the live stream; it’s better to invite someone you know and the other person agrees to show up live. Sometimes if you take a fan on the live stream, and he or she doesn’t want to show up on the camera and just responds through voice, then it becomes a little boring for the audience and awkward for the Instagrammer. So whenever you co-host a live session with someone, make sure that the other person has something important to share on the topic, and agrees to show up on the camera. A mistake a lot of people do while doing a live stream on any social media platform is that they ignore the comments from the audience. It makes people annoyed when they keep saying something to you and you don’t even look at their comments or read their comments but don’t respond to them. The best way is to tell your audience that you’d reply to the questions in the last 5 or 10 minutes. So keep their questions ready at the end of the live stream. It gives them a little satisfaction that you’d respond to them. When you communicate with your audience this way, they also help you out and even tell the newcomers who join the live stream after some time and ask the similar questions again. Live streaming is a fantastic way of growing your Instagram followers. Many of us don’t know how to utilize this tool for the better. I have tried to share my best tips that I learned in the past few years with my live streaming on Facebook. If you’re on Instagram and not using the live stream feature, then you’re making a big mistake. You must communicate with your audience through live video because it brings in the engagement and traction, which will help you in gaining momentum and attention on the platform. Would you try out Instagram live streaming after reading this article?